Lately I’ve been writing about all of the wonderful daily nutrients we need. But today, I am for sure going to tell you about one of my favorite topics: Minerals! These 16 lovely nutrients are something that we must get in our foods and supplements, and each of them are something that we should be getting a certain amount of every day! You would think that with the typical foods we eat it would be easy to get all of the minerals we need, but it’s not! Meat and dairy provide a handful of them like iron, zinc and calcium, but the majority of our minerals in the American diet come from the foods that absorb them in the soil that they grow in! This means that plant-based foods like whole grains, nuts, winter squash and other plants are supposed to be excellent sources for the minerals that we need. Wait, did you catch that? I said “supposed to be” and unfortunately I meant it. The reason that these foods are not as rich in minerals anymore is because of the soil they grow in. For thousands of years, farmers have grown their crops in a refined and precise manner to produce the best foods that they possibly could. This was back in a time before we developed mass-production of crops in a method called conventional farming. Conventional farming practices are the much more common, modern farming methods that are designed to produce the highest yields possible in crops so that profit is maximized. Traditionally farmers knew that the soil needed time to “rest” in between crop seasons, so they would rotate their crop by planting a different crop in the same place. The reasoning behind this is that certain foods absorb more minerals than others. So if you rotate crops, this gives the soil time to replenish the original minerals for the next time that a food absorbs it. Conventional farming does not rotate crops. Instead, the same food is planted over and over again in the same soil, and the soil is essentially sucked dry of the minerals that the plants tend to absorb. Research shows that the mineral content of soil over the past 160 years has significantly declined. It is a sad, but true concern that we may need to seek out our nutrients in the future from something else in addition to our food. Okay, enough of the sad stuff! Let’s talk about something really cool! Even though our soil may not have enough minerals, it is actually not the only place on Earth that is rich in them. Do you know where else is rich in minerals? The ocean. Yes, the ocean is essentially a mineral oasis! And that’s why It’s Vital Minerals is so stinkin’ cool – because it uses one of the top resources for algae minerals to supply you with the nutrients that you’re probably not getting enough of! Aquamin Red Algae in the ItWorks It’s Vital Minerals contains nine minerals that many people in this country aren’t getting enough of. Magnesium is a huge one. I know I have said it before but I’ll say it again – 60% of this country does not get the recommended amount of magnesium! Calcium is also incredibly important especially if you do not eat a lot of dairy products. 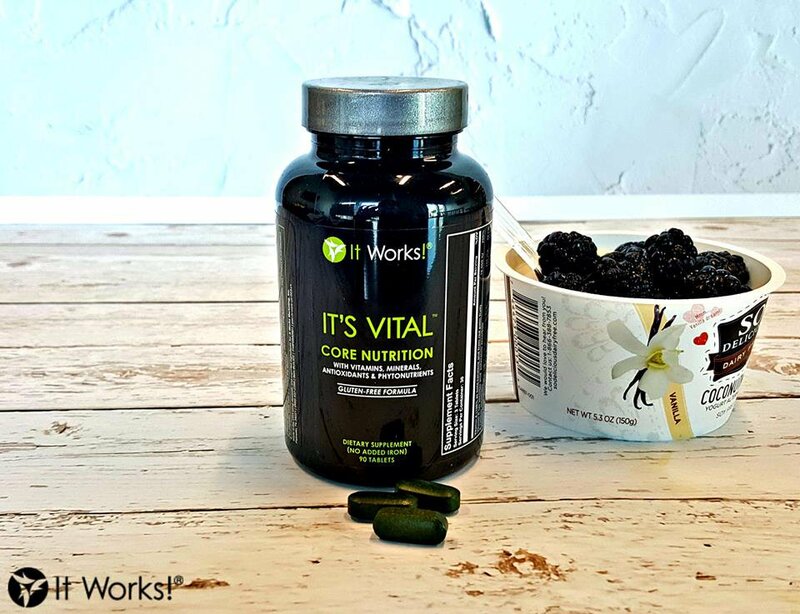 What is even more wonderful about the ItWorks Minerals is that it also contains 250% of your daily vitamin D – a vitamin that helps you absorb calcium better and is also a common deficiency in people in the U.S.! And just as a side note, I firmly believe that if you want to lose weight (and keep it off) you need to give your body what it needs to succeed in doing this. You can definitely lose weight without adequate nutrients, but the real questions is: how long can you keep it off without them? 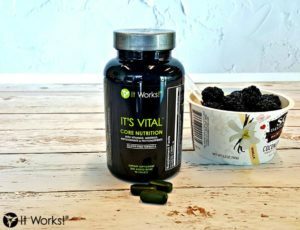 So now that we have gone over the final piece of the Complete Nutrition Pack, my hope is that you now realize the importance of all 3 daily nutrient blends and how they can help you in succeeding in your health and weight loss goals. We have to have the right foods first, but juggling weight loss with enough of the nutrients that we need is almost never easy, so that’s why I’m here! By finding the right balance in your nutrition, you can lose weight AND feel better. I can’t wait to see how successful you will both look and feel once you get going! Fan M., Zhao F., Fairweather S., Poulton P., Dunham S., McGrath S. Evidence of decreasing mineral density in wheat grain over the last 160 years. Journal of Trace Elements in Medicine and Biology. 2008:22;315-324. Frestedt J. Aquamin Research: Minerals from Red Algae. Oceanography. 2013:1(3);114. Volpe S. Magnesium and the Athlete. Nutrition and Ergogenic Aids. 2015:14(4)279-283. Forrest K., Stuhldreher W. Prevalence and correlates of vitamin D deficiency in US adults. Nutrition Research. 2011:31(1);48-54. When I read about the contents of this Core Nutrition daily, my mouth was practically watering at the deliciousness of nutrients my body was about to receive!! The problem with most multi-vitamin supplements these days is that they are just a jumble of some less important things and also more important things in not enough of the right amounts. In other words, multi-vitamins are multi-random. There are very few items on the market that actually consider the nutrients that are present in the American diet, and design an item that helps to make up for the things that we commonly lack. This stuff has all of that, and THEN some! Are you ready for this!? …I don’t think you’re ready for this! Let’s take a look at the common American diet – i.e. meat and dairy and potatoes. There is nothing wrong with eating these foods as long as it is in balance with all of the other foods that provide us with all of the other nutrients we need! Think about it, there are 29 vitamins and minerals that are essential for us to get through what we eat and drink. Not only that, but to keep our bodies happy we need additional nutrients like omega 3s for our brains and phytonutrients which help to fight off cancer! If you think that eating all of these nutrients is easy with what we usually eat, it’s not! Meats are a good source of B vitamins, but not vitamins A, C, D and E. Dairy is a good source of calcium and vitamin D, but not vitamins A, C and E. Potatoes, well, if you eat the skin they have some potassium but let me be honest, when it comes to vegetables, you could do wayyy better! So with all of this in mind, Core Nutrition is by far and away one of the best multi-vitamin supplements that I have seen on the market. You might as well just call it a multi-nutrient because the prior doesn’t do it justice. 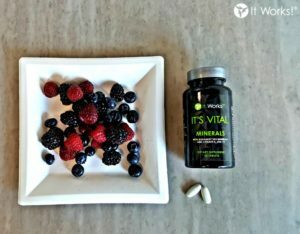 With at least 100% of the vitamins that American’s are most deficient in, and way more of the other nutrients that typically aren’t even in other supplements, it’s more than safe to say that this multi-nutrient is enough to replenish you to the core 😉 Stay tuned for the trifecta finale in our It’s Vital Complete Nutrition Pack! Haytowitz, D., Bhagwat S. USDA Database for the Oxygen Radical Absorbance Capacity (ORAC) of Selected Foods, Release 2. U.S. Department of Agriculture. 2010. http://www.ars.usda.gov/nutrientdata. Ravi, M., De S., Azharuddin S., Paul S. The beneficial effects of spirulina focusing on its immunomodulatory and antioxidant properties. Nutrition and Dietary Supplements.2010:2;73-83. Koch, C., Gladwin M., Freeman B., Lundberg J., Weitzberg E., Morris A. Enterosalivary nitrate metabolism and the microbiome: intersection of microbial metabolism, nitric oxide and diet in cardiac and pulmonary vascular health. Free Radical Biology Medicine. 2017:105;48-67. Dominguez, R., Mate-Munoz, J., Cuenca, E., et al. Effects of beetroot juice supplementation on intermittent high-intensity exercise efforts. Journal of the International Society of Sports Nutrition. 2018:15(2);1-12. This probably isn’t the first time you’ve heard about omega 3s. You may even know that fish and cod liver contain a large amount of these essential fatty acids. 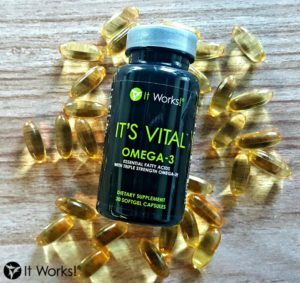 But if you’re wondering what supplements could be the most important to add to your daily regimen, omega 3s tend to be one that I recommend the most! So if you are curious about why this daily enhancer is so important for our health as a whole, read on! As is true with any other nutrient, one that is “essential” means that our bodies cannot make it themselves, and we need it to survive! Therefore, it is essential that we get these nutrients through our diet if we do not want to be deficient! Many vitamins and minerals are essential, but when we get into the topic of fats, there are actually two types of fats that we must consume in our diet as well: omega 6 and omega 3. As Americans, we typically do not have much trouble at all getting enough omega 6. These essential fats are found in foods such as meats, breads and soybeans; which make up a large proportion of the American diet. Although omega 6s are essential for the human body, they tend to have drawbacks as well. Omega 6s are known as “pro-inflammatory”, meaning they can promote inflammation, and especially when consumed in excess. Then we get to omega 3s, which are actually a potent “anti-inflammatory”! These essential fats are found in high amounts in fatty fish such as salmon, tuna, mackerel, herring and sardines. In a much lesser extent, they are also found in foods such as chia seeds, walnuts and eggs. 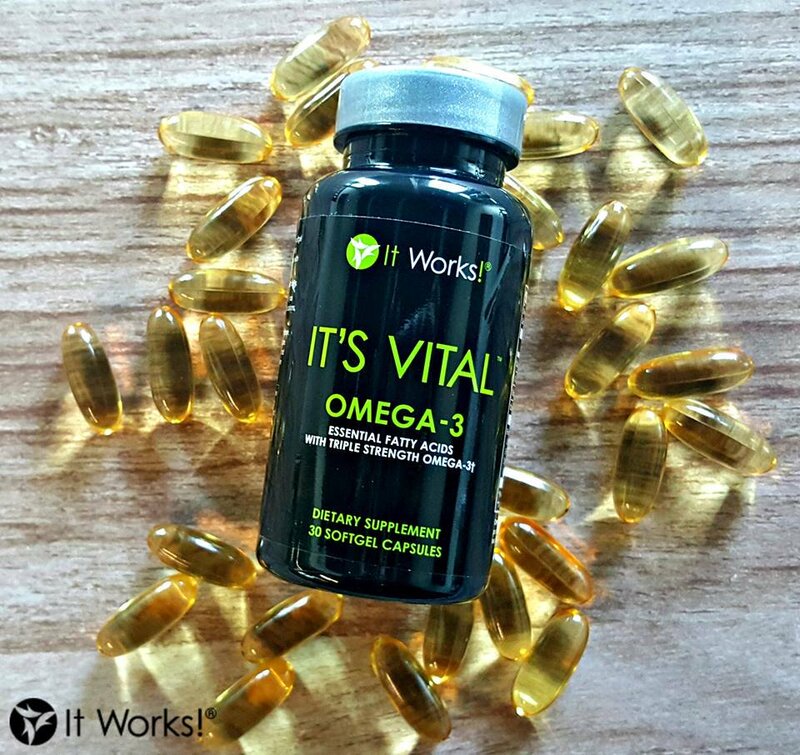 Because these omega 3s have the power to control inflammation from omega 6s (and also many other sources such as stress, poor diet choices and physical activity) experts recommend consuming omega 6s and omega 3s in a ratio of 2:1 or 1:1 within our diet. Now we get to the problem. In fact, Americans do not get even close to these ratio recommendations for omegas! Instead of 1 or 2 omega 6s for every omega 3, the average American actually consumes 15 to 16 omega 6s for every omega 3! No wonder inflammation is a concern in today’s day and age! We are eating too many pro-inflammatory foods and not enough anti-inflammatory ones. In order to balance out our omega ratios, we can do 1 of 2 things: eat less grains and meats (which contain omega 6s) or eat more fatty fish (which are high in omega 3s). While I’m sure we could all eat a little less meat and grain, we need to address the fact that by doing this exclusively does not increase our intake of the omega 3s that we need to survive. Also, to increase our intake of omega 3s, experts recommend consuming fatty fish 2-3 times per week. For some this may seem plausible, but think about doing this every week for the rest of your life! Maybe then it makes sense to have a backup supplement in case you don’t eat all of that salmon and tuna! Simopoulos, A. Omega-6/Omega-3 Essential Fatty Acid Ratio and Chronic Diseases. Food Reviews International. 2004:20(1);77-90. As many of you have been following along with my posts about our new CollagenWorks, we had at one point scratched the surface of another one of our supplements, Hair Skin Nails, and how it differs from the collagen line. Because there is just SO much more to it then what we have talked about, I want to dive in to 3 reasons (aside from your hair will grow) why this herbal beauty powerhouse is so effective and can help what could be your best features grow and glow! Let’s be honest here…Do you find yourself eating the same thing every day because it’s either fast, easy or you simply just don’t want to get creative with what you eat? I work with many clients who feel this way, and yogurt or oatmeal is a regular thing for breakfast almost every day of the work week. While it is great that you are putting these healthy whole foods into your diet, if you aren’t switching up your routine enough, you end up getting the same nutrients every time, and don’t branch out to eat the rest of the nutrients that your body needs to look radiant! This is why Hair Skin Nails provides the nutrients you need to grow these features and help them look strong and healthy! You don’t eat a lot of food! Call it a hunch, but my assumption is that recently you have been trying to lose some weight by eating less. While this can be effective when done properly and with precision, the more calories you cut out of your daily diet, the greater your chance is that you are not receiving enough of the nutrients you need to maintain your glimmer! 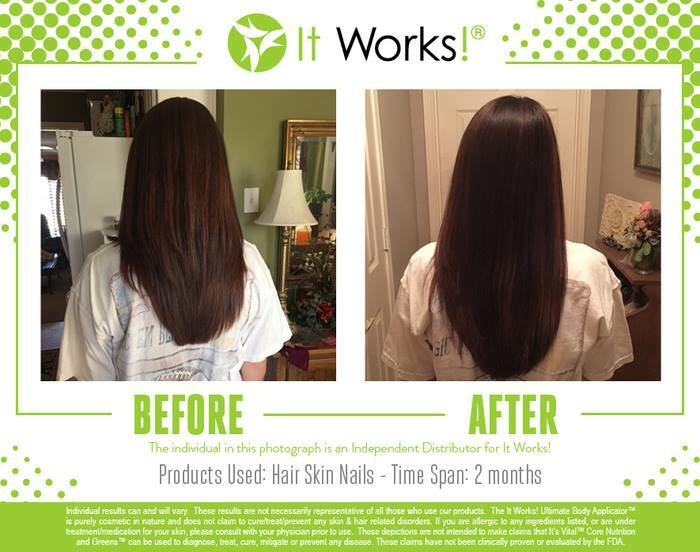 I have good news for you: you can keep up with your weight loss regimen and still have beautiful hair, skin and nails. In fact, this is part of what losing weight the “healthy way” means! Hair Skin Nails provides the nutrients that are in whole foods which may also make it more difficult to lose weight because of all of the calories. Vitamins E and B6 and the mineral zinc are a few of these, all of which are provided in more than 100% of your daily recommendation! Therefore, if you can cut out what is unnecessary and keep what is by using HSN, it is possible to have a slimmer figure AND a beaming glow! I think you should be able to have a glass of wine every now and then when you’re trying to be healthier! However, science shows that the toxins that build up in our bodies from excess consumption of alcohol, fried foods and sugar can all make an impact on how well our bodies thrive. Since our hair, skin and nails are an outside reflection of what is going on inside of us, if they aren’t strong and shimmering (like they should always be) then it could be an indication that you need something to help your body detox! Hair Skin Nails is great for this reason because of its proprietary blend that contains grape seed extract, a potent antioxidant, and Extramel© melon pulp concentrate, one of the best melon extracts on the market! Extramel has not only been show to be a potent antioxidant, but also alleviate stress and fatigue in clinical trials! Glowing hair, skin and nails AND less stress and exhaustion? Me please! So now that you know 3 of the major factors that impact hair, skin and nail health, I hope you can consider if they are applicable to you. These physical features are really good at telling us when things aren’t “alright” in our lives. On the other hand, they can give us great insights to figure out what we need to be doing to make it “all-right”! 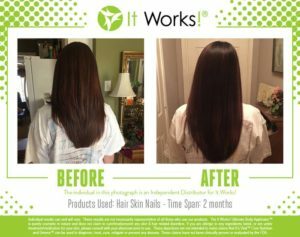 It Works has already done that research and put their findings into Hair Skin Nails, so why not make it more than just alright? Make your presence a lasting effect! Milesi M., Lacan D., Brosse H., Desor D., Notin C. Effect of an oral supplementation with a proprietary melon juice concentrate (Extramel®) on stress and fatigue in healthy people: a pilot, double-blind, placebo-controlled clinical trial. Nutrition Journal. 2009:8(1);1-7. Shi J., Yu J., Pohorly J., Kakuda Y. Polyphenolics in grape seeds-biochemistry and functionality. Journal of Medicinal Foods. 2003:6(4) 291-299. Stott-Miller M., Neuhouser M., Stanford J. Consumption of deep-fried foods and risk of prostate cancer. Prostate. 2014:73(9);960-969. Aggarwal B. Targeting Inflammation-Induced Obesity and Metabolic Diseases by Curcumin and Other Nutraceuicals. Annual Reviews Nutrition. 2010:30;173-199. Wang X., Liu C., Stickel F., Seitz H., Russell R. Chronic alcohol intake reduces retinoic acid concentration and enhances AP-1 (c-Jun and c-Fos) expression in rat liver. Hepatology. 2003:28(3)744-750. Is It Works a Scam? Hey! Want free workout and nutrition info? 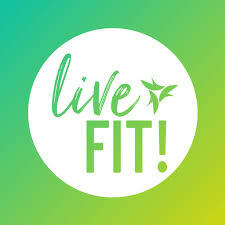 Download LiveFit!